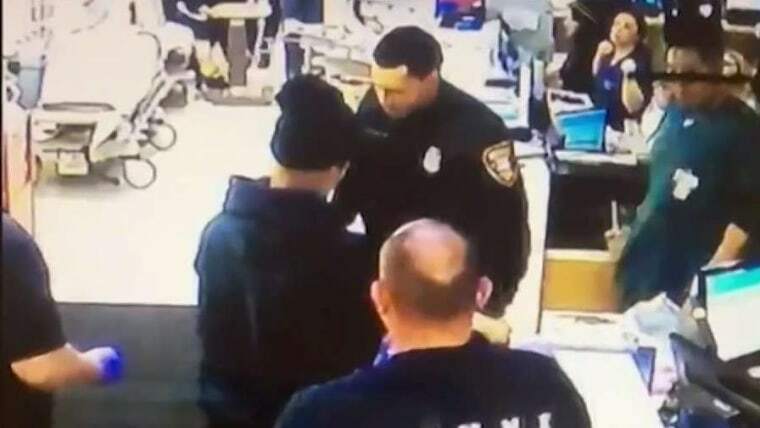 A cellphone video showed the officer violently slapping the man as he lay in a hospital bed. The assault continued in the man's room. In the cellphone video shot by Officer Then, the man could be heard telling the officers: "You're a b-tch." "Right here, you see my cheek?" the prone patient challenged. "Do it." That's when McAusland put on white hospital gloves and violently slapped him hard across the face twice, the video showed. The man already had cuts on his face and McAusland's slaps were so violent, that blood appeared to go flying onto the white bed sheets by the victim's shoulder. McAusland's sentence is also for selling marijuana, cocaine and heroin to a cooperating witness between October 2017 and April 2018, authorities said. McAusland told investigators that he stole these narcotics from a crime scene while on duty. “Through prosecutions like this one, police officers like McAusland — who dealt drugs, stole from a crime scene, and viciously attacked a person who sought help from the Paterson Police Department — are removed from positions where they can violate the public trust and deprive others of their civil rights under color of law," U.S. Attorney Craig Carpenito said in a statement. "We will continue to vigilantly pursue these cases, recognizing that the people of Paterson, and all of New Jersey, deserve better,” he said. FBI Special Agent Gregory W. Ehrie, who runs the Newark office, called the case "troubling." “When an officer betrays the oath to protect and serve, it tarnishes the law enforcement community and puts the public at risk," Ehrie said in the statement. McAusland's lawyer could not be immediately reached for comment on Friday. His former partner, Officer Then, has pleaded guilty to one felony count of concealing civil rights violations. He's scheduled to be sentenced April 2.